The park that brings movies to life! Universal Studios brings Lights, camera, and Hollywood action to Florida residents and tourists from all over the world. This theme park gives us the opportunity to experience the magic of the big screen as a viewer and as a performer. Whether you’re on a simulated ride, roller-coaster, or walking on a set, you’ll get to go behind the scenes of some of your favorite movies! Tip: This exciting theme park can be a welcomed thrill for those who love stimulating the senses, but it can also be overwhelming for those who experience sensory overload. I would purchase my tickets online to avoid the long wait at the purchase windows (You can wait on a much shorter line for several kiosk machines to pick up your ordered tickets). Click here for more information on purchasing tickets online. Have a cold juice box, water bottle, and snack in your travel bag, just in case the entrance wait is a little longer than expected. Parking: If you have an accessibility/disability parking pass or plate, mention this to the clerk at the toll plaza, and they will direct you to accessible parking area. Otherwise, the parking garage is quite a walk away from the park entrance, although a nice one. Tip: The parking garage is themed with comic heroes, villains and memorable movie characters, I suggest taking a picture of the marker, so you don’t forget where you parked! 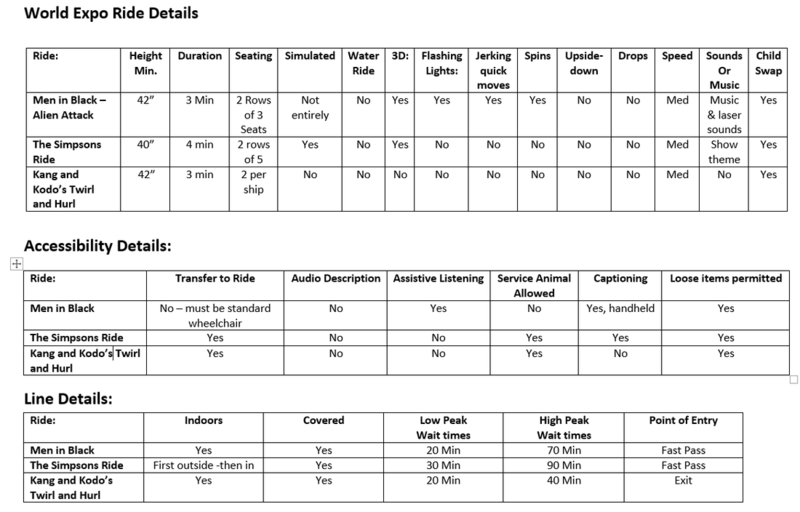 Stroller, Wheelchair, and Electric Convenience Vehicles (ECV): Rentals are available on a first come – first serve basis. You can rent these items at the Parking and Transportation area, and at the park entrance at guest services. When you pass the entrance gate, the Guest Services building will be located directly to your left. 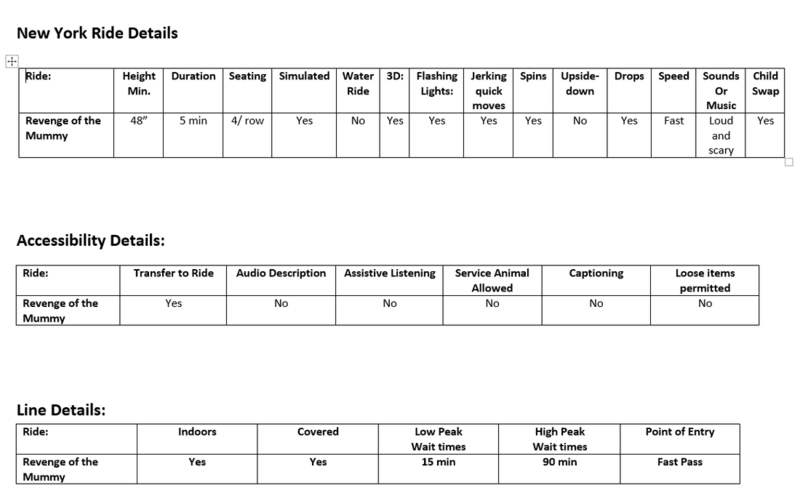 Please note that none of the rides at Universal can accommodate the electronic wheelchairs. 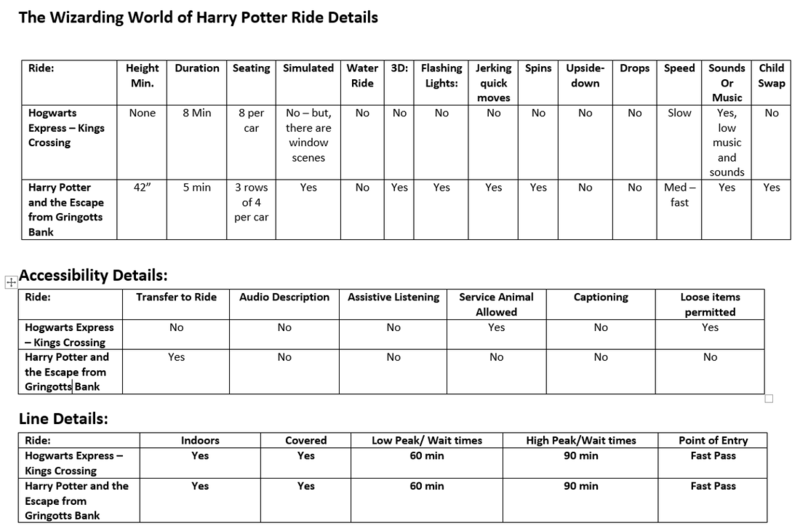 If you’re using one, you’ll need to transfer to a manual wheelchair before riding the attraction (with the exception of the Hogwarts Express ride). Special Pass for Individuals and Families of Children with Disabilities: For children and individuals with disabilities who experience difficulty with waiting on long lines, Universal Studios has an “Attraction Assistance Pass.” After you enter the parks gate entrance, you’ll have to go to Guest Services, which will be located at the building to your left. Please note that presenting this pass will not give you instant access to an attraction, but it will significantly decrease your wait time. I would suggest bringing a letter from your doctor explaining your loved one’s diagnosis and their inability to wait on long lines. At this time, this is not required, but rules change all the time, and it’s better to be prepared than not. My son has autism, and he exhibits behaviors that are indicative of him having a cognitive disability, as a result, we’ve never been asked to produce any information. However, for disabilities that are not as obvious as physical or cognitive impairments, it’s a good idea to have your doctor’s letter handy. Once you have the pass, you and members of your party (6 people maximum) will be able to avoid the long wait for lines. Here’s how the pass works: you’ll present the pass to the attendant at the ride entrance. If the line wait is less than 30 minutes, then the attendant will direct you to either a special entrance, the express entrance, or you’ll be instructed to go to the ride exit and show the pass to another attendant. If the ride has a 30 minute wait and longer, then the attendant will write a return time on the card, sign it and tell you which entrance to come back to when you return. Between Transformers ride and Mel’s diner. The park entrance leads you straight into Production Central. This section of the park is cleverly themed as a Hollywood set. Here, you’ll find restaurants, opportunities to take pictures with characters, and a few of the greatest rides you’ll ever experience! Despicable Me Minion Mayhem – Our favorite movie characters are brought to life in this hilariously brilliant simulated 3D ride. The line for the entrance starts outside, but if you’re entering through the fast-pass line, you’ll be inside Gru’s gloomy home in no time! After grabbing your 3-D glasses, you have a five minute intro video to watch while standing just outside the entrance doors to the actual ride. Gru, and his daughters, Edith, Agnus and Margo, welcome you to pilot their newest invention: turning humans into minions! When you finally do walk through the ride’s entrance doors, you’ll notice the auditorium type seating. You’ll be asked to walk all the way to the end of your row, until all seats are occupied. Guests will sit on a bench that seats four side-by-side, as you buckle your lap belt. Hold on to your seats, because sudden motions will bump you into this adventure ride. The ride seats vibrate, bump and jerk up and down, and little sprinkles of water are also felt. This is one of Richie’s favorite rides (mine too)! Transformers Ride - The famous movie franchise earned its place at Universal Studios as a fan favorite attraction. This ride invites you to interact with your robotic heroes! You are in the middle of a galactic war, as the Autobots fight to prevent the Decepticons from ending man-kind. Optimus Prime asks for your help in defeating the Decepticons. Filled with action, special effects, and exciting twists and turns, you are guaranteed to love this sophisticated simulated ride. The car ride takes you through dark corridors, there will also be flashing red-lights, sirens, and action-packed scenes with loud-movie theater type audio. You’re going to ride through city streets, crash through an office building, come face-to-face with Optimus Prime and Megatron, as well as be right in the middle of some major robot battle scenes! Some children who are young or sensitive to sound, lights, and dark tunnels might not like this ride. There may be some scenes that are a bit scary for little ones. Shrek 4D – This is not a ride per se, but if your family loved the movie Shrek, then this is a treat for you. The show is about life for Shrek and his lovely bride Fiona after their wedding. It’s a wonderful show, but be prepared for a few things. One, the introduction to the show is very lengthy. You’ll be standing in a room listening to the mirror and other Shrek characters interact with one another and you about what’s going to happen next. Then you enter the theater and sit by side in a long row of seats that stretches across the large screen. The show has some scary elements as it involved a graveyard scene, but the effects are incredible. You’ll wear 3D glasses, the seats move and jerk around, there are sprinkles of water felt, and other sounds during certain scenes of the show. My son loves it because he is a huge Shrek fan, and because we love it so much and if your child can handle the sensory stimulation – you’ll enjoy it too! Universal really knows how to welcome its visitors to the classic streets of the Big Apple as it was set in the 1930’s, 40’s, and 50’s. You’ll find street vendors and fine dining options in this fun section of the park! Revenge of the Mummy! – I absolutely love this ride. Of all the rides at Universal, this is my all-time favorite, because it has everything. It has masterful simulated effects, it features the movie’s original cast, and there’s a short but exciting fast roller-coaster ride! The ride takes place indoors, and even the walk to the ride is a fascinating one that’s riddled with the same cave-like ancient Egyptian theme we recognize from the Mummy movies. I will admit that this ride is way too scary for little ones, kids susceptible to nightmares, or anyone with sensory overload issues. The ride begins with startling warnings from the scary Mummy Imhotep, from there on it’s scary twists and turns with skeletons, mummy’s and those little flesh-eating creatures! Some of nature’s elements play a role on this ride too - you will feel wind, drops of water, heat and you will see fire during several parts of the ride. The entire roller coaster part of the ride is in the dark, but there’s loud sounds and winds as well. Richie and I usually ride this one twice! Some of the finest restaurants can be found in this section of the park. It’s exciting to know that this quaint park area will also be the new home to the much anticipated, Fast and the Furious: Supercharged attraction – coming in 2017! Disaster! - This isn’t necessarily a ride, but it is a fun attraction that features you as a starring character in the movie production. It’s fun for anyone who truly loves the art of the entertainment industry and the behind-the-scenes action. This experience begins with an introduction to cinematic creation by hilariously funny cast members. You’re standing while listening to this introduction for about ten minutes. Then the host invites audience attendees to participate as a volunteer cast member as they enter the next phase of the show (still standing) for about another ten minutes. They demonstrate the use of camera effects and various sets and scenery. The final part to this fun adventure allows you to get on a train (you are seated in rows that accommodate about five people in each row) that goes through the movie effects of a natural disaster in an underground tunnel! This attraction has loud noises, flashing lights (white and red), sounds of sirens, winds, explosions, sounds of electrical malfunctions, fire, and water flooding. You won’t get wet, but you will see the effects of all these things happening relatively close to you. Update 2016: This attraction has been closed to make room for the anticipated Fast and Furious attraction! Every time we visit this section of the park, we are amazed by the immediate life-like transportation from Orlando to the world of Harry Potter. This is an easy section to miss, so keep your wizard senses keen. You don’t want to miss walking through the legendary wall on platform 9 ¾ ! While most of us are wearing our ordinary muggle clothing, Harry Potter fans will be showcasing their wizard robes and wands. You’ll want time to explore these beautifully designed streets lined with shops of wizard crafts and merchandise. Don’t forget to try the Butter Beer (it’s loaded with sugar and cream and all things kids love)! You’ll especially love the fire-breathing dragon that’s perched on Gringotts Bank! Hogwarts Express – Kings Cross Station: This is one of the newest attractions at Universal. It may be a slow moving train, but it gives you the chance to experience the ride Harry, Ron, and Hermione, had when they first made their journey to Hogsmeade. Each train car seats about eight, the visual effects are fantastic, and a major plus is being able to take a break from all the walking! Another plus is this ride connects from Universal to Islands of Adventure. 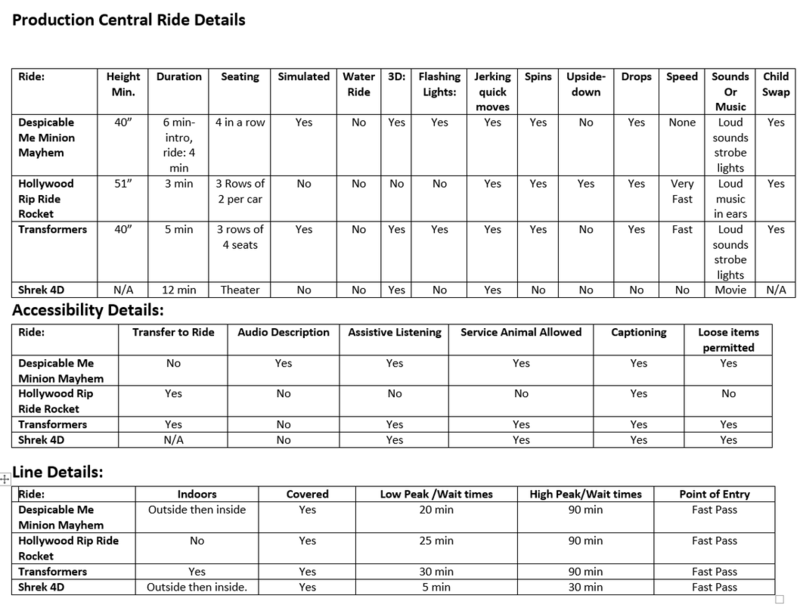 Note that you’ll need a park hopper pass to ride any other rides on the other side. Otherwise, you’ll just need to take the train ride on back to Kings Cross station! Harry Potter and the Escape from Gringotts Bank - I must admit that of all the Harry Potter attractions, this is my favorite one. I love 4D rides and this one does not disappoint. It’s a fast-riding roller coaster ride that combines the fun of a coaster ride with a magical adventure featuring great effects. What starts out as a simple trip to the bank ends up with talented wizards helping you to escape Gringotts bank from the evil Lord Voldermart! The fast moving ride is indoors, has little lighting, there is flashing lights, loud sounds, winds, high graphics, and scary moments for little ones. If you’re a fan of the Simpsons, Men in Black and shopping, this section is where you’ll want to be! You’ll not only have a great time going on a shopping spree, you’ll enjoy some of the best rides in the park. Men in Black – Alien Attack: Calling all rookie agents! You’ll be ready for any space invaders by practicing your laser-beam shooting skills on this ride. This is a six-seater per car ride (three in the front and three in the back), but there’s also ones that allow wheelchair users to ride without having to transfer. However, it must be a standard wheelchair. Each rider is equipped with a laser gun and scoreboard that tracks the number of aliens hit! ​It’s a fun ride, and although it’s not especially scary, there are some areas where it is dimly lit. Most of the ride is bright with color. The aliens are not really scary looking either. This is a ride that tests your target practice. 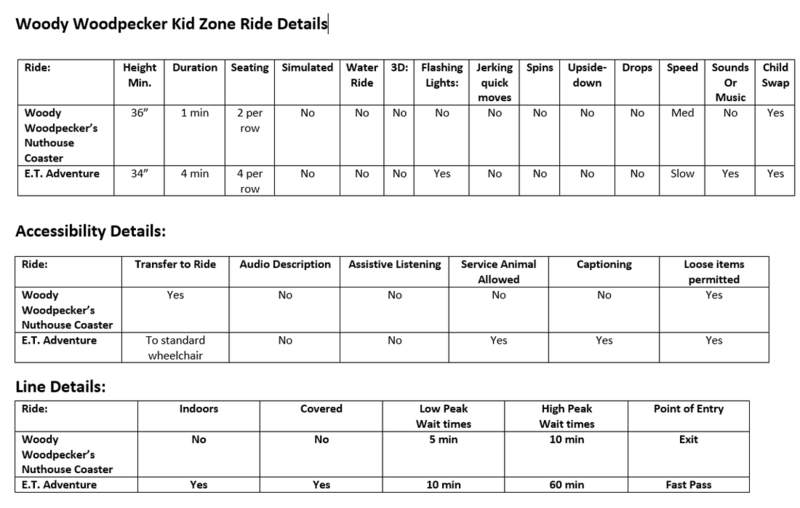 Most kids love this ride, but please note for our children with sensory issues, there’s a lot of buzzing, beeps, laser sounds, and flashing lights. The Simpsons Ride – This is one of Richie’s favorite simulated rides! Located in an area designed just like the television show’s Springfield, you’ll feel like a neighborhood friend! This is a ride you don’t want to miss. The car seats two rows of four comfortably, and you might be riding with others in the same car if your party isn’t large enough to fill both rows. The car lifts off the ground facing an 80 foot large Imax screen with the best simulated effects you’ll ever experience! The ride takes you through Springfield, on a roller coaster, for a ride across the water and beyond. By the way, there is a fun part that includes baby Maggie swallowing you and spitting you out (you get to smell actual baby powder too)! It should have been called Fun-Zone, because fun is what your kids will have when they visit this section of the park! Surrounded by fun rides, games, character greetings, and family friendly shows, expect to spend some time in this area if you have little ones. Woody Woodpeckers Nuthouse Coaster – From the ultimate thrill seeker to the kiddie ride lover, the whole family will love this ride! This mini-coaster seats rows of two and keeps kids and adults amused with light dips and winding tracks that keep the ride gentle and fun, as you listen to Woody’s laughter and his pecking at trees! E.T. Adventure – I truly love this ride, because it has a perfectly themed story line to kick off your extra-terrestrial adventure. However, it does have a lengthy introduction. Your first room is dark and features a brief video of Steven Spielberg himself giving you instructions on your mission to help save E.T.’s friends and planet. The video lasts about two and half minutes. Then each rider has to have an interplanetary passport before boarding the ride! This doesn’t take that long, but for kids or adults with special needs, we sometimes have to prepare for every moment that may require some patience. The walk to the ride is a fascinating one. You’ll feel like you’re in the very forest E.T. got lost in, passing trees and rocks while walking along a wooded path, listening to the chirping sounds of birds, and forest animals! It is dimly lit, but not very scary. The ride itself is setup with three rows of four bikes. It’s a slow moving ride that has short dips and easy turns and moments where you will glide over the city passed the moon! Music plays throughout the ride in the background. There is flashing lights, beeping and loud sounds throughout the ride. For the park map, please plan your trip at the park and click here: Universal park maps. Please note we are not endorsed by, or affiliated with Universal Orlando Theme Parks. This information is subject to change without our knowledge.